It has been a really full on week this week! Life continues to try and get in the way of art. All those mundane and tiresome things, like having enough food to put on the table and actually paying your mortgage are such a bind. It wouldn’t be so bad if I had a part-time job, like say, Deliveroo. I have genuinely got to the point of having to go busking for food money on more than one occasion in the last twelve months. I am quite a fan of the old gig economy. It’s flexible to a point, allows for you to structure your working life around your chosen art and can even net some reasonable cash. I think the gig economy is one way forward for artists and creatives who are constantly trying to reach an art/life balance. The only issue I had with Deliveroo as such, was the soul-eroding reality of delivering Burger King meal deals to parents, who viewed it as a healthy option for their 5 kids. Or the constant lack of tips from the student population, despite their having enough money to drink themselves into oblivion most nights of the week, order up their fried breakfast from an overpriced cafe, add £3.00 delivery and do the same again for tea. All of this whilst seemingly having no money to offer a nominal tip to the rider who has just ridden their food across town to them. More often than not in the pouring rain. (I should point out that tips are factored into the figures for earnings by Deliveroo) To be fair I have delivered food to a student who lived on the other side of the road to the restaurant I picked up at, so it’s not all bad. Probably worse than non-tipping students are the middle class privileged who will order 8 or more meals on a Friday night, including one or more litre bottles of fizzy drink, thus rendering the bag too heavy to safely ride. These people (of which I regularly delivered to four) will moan or tut as they open the door to your sweating, puffing face and look at their watch with a disapproving look – “You’re supposed to be here within 15 minutes” they would say, tapping their watch like a parent chastising their child. “Yes. True”. I replied on one occasion. “But you live at the highest point of Plymouth and the restaurants are at sea level! I have just climbed two significantly steep hills that would not be out of place on a Tour De France stage, to bring you your dinner. It has taken me sixteen and a half minutes. Please, feel the weight of this bag.” This particular customer was an arse. He was very rude and he would insist on leaving the direction, Pedal fast!! on the app, complete with exclamation marks. This instruction would handily scroll across the bottom of the app, just in case you forgot whilst struggling up the second 20 percent gradient. To give him his due he did try and lift the bag and struggled to get it off the floor. He looked genuinely shocked, almost concerned. However, he soon reverted to type with – “Well, that is kind of your job”. This is also true, I reminded myself biting my tongue. Well biting my tongue to a point. “I couldn’t help but notice that you didn’t tip online……. again. Just to let you know that we are fine to accept a cash tip”. He smiled – and with a flippant, “Maybe next time” slammed the door in my face. Life is an expensive game. I am, as I have adequately demonstrated, sadly unemployable in the commonly accepted sense of the word. No one recruiting for any quality positions wants a nearly 50 year old man, let alone one who spent 18 years of his life playing records for a living whilst nonchalantly indulging in his own privately funded chemical trials and whose only real experience in “proper” work amounted to him going into companies and telling them where they were going wrong. (Its called consultancy). The problem is, people soon get bored of you telling them they’re doing things wrong. Especially when they are effectively paying you to do so. So I find myself not only working really hard on the poetry and performance aspects of my life but simultaneously building and developing a business of my own. Even without the added pressures of trying to make a living from an art form or creative skill, having one’s own business can be a tough life choice. Doing both can become very hard going. With all this in mind, is it any wonder that I get slightly miffed at the idea that people want artists to travel to their night, perform and then pay for the privilege. Now, before I continue, let me qualify this. I have no problem in paying to get into a night which features a quality headliner and that has an open mic aspect to it. This makes perfect sense to me. However, if you are INVITED to perform on the notion that you have something to add artistically to the night and the promoter tells they specifically want you on that basis, then that my friends, is a booking, not an open mic. Bookings should, in my view, attract at the very least free entry to the event and if possible some remuneration, even if it is a couple of free drinks. After all, you have been engaged because the promoter has asked you to perform. I run Pucker Poets with the principle that art has a value. I run the Pucker Poets stage at Glas-Denbury on the same basis. No performer or supporting act pays to get in at Pucker. All supporting acts get at least 15 minutes to perform, some choose to only do 10, that is their choice. Very often they also get paid a minimum of £10.00 plus a drink and in reality that comes out of my own pocket. Headliners get a proper fee and travel costs in addition. Slammers get half-price entry and a one in four chance of walking away with £25.00 cash. That’s how the night works. Even if it costs me money, which most months it does. In return, however, I get to network with some amazing people, support them and enjoy their performances as well as see other local artists developing their skills. I view this as value for money. I also started an open mic night in Plymouth that regularly pulls 8 or more performers. The venue pays me a fixed fee and takes the drinks revenue. The performers can perform two sets of up to 5 minutes for free and they get a free drink. This happens because I negotiated with the venue and work hard to increase their revenue on an otherwise quiet night. They have no issue with paying me a fixed fee. They have no issue in giving performers a free drink. I spoke to 9 venues before I found one that appreciated what I was offering. This night works for everyone. Taking the mic in Exeter is a very similar arrangement. There is no door tax. This is how an open mic can work. Why aren’t all open mics run like this? Is it because as promoters, we don’t sell the concept well enough to the venue? The truth is, I am very concerned about this pay to play culture. It smacks of a lack of respect for fellow artists, the lack of respect we have for our own performance skills and time and in all honesty, encourages lazy promoting. If you can fill your room full of people willing to pay for the privilege of performing 5 minutes and this covers your costs, as well as filling your venue, then you don’t really need to try to draw in and build a crowd as such. You are also less inclined to grow the night to a bigger venue and build the quality. I feel this is an important issue, worthy of debate. Poetry is in a growth period – now is the time to shake up how nights are structured. If a poet/promoter doesn’t respect the time and effort of his fellow poets, who else will? More to the point, how much respect do we have for ourselves if we are willing to pay for the privilege of performing? There is a parallel that can be observed. Look at the once buoyant and financially viable area of the club DJ. I mean the regular club DJ, pre the superstar DJ era of the nineties. This job has all but disappeared. DJ’s will now willingly pay £150 for a chance to play at an event and sell tickets to their friends to recoup the loss. This is insane. Even more of the bedroom DJ fraternity will play for free. The quality of events has suffered as a result. 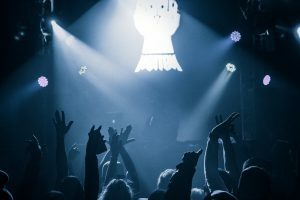 DJ’s now feel entitled to turn up and play what they want, have lost the art of reading a crowd and programming a night and have no invested interest in the event or the brand outside of their set. Not only that, but it makes the opportunity to perform available only to those who can afford to pay. If you require Bespoke Poetry, Poetry performance, Creative Writing, Script, Voice Over, Corporate event services, Host, MC, Wedding Poetry, then please get in touch! Previous PostPrevious And All Those Who Sail In her!